Leading a small colony, your must build a great empire, make alliances and conquer your foes! 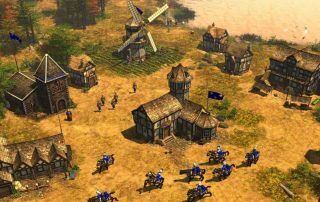 Age of Empires III is a real-time strategy video game developed by Ensemble Studios and published by Microsoft Game Studios on October 18, 2005 in North America and November 4, 2005 in Europe. It is the third installment of the Age of Empires series that follows Age of Empires II: The Age of Kings published in 1999, as well as its expansion, Age of Empires II: The Conquerors. The game takes place during the colonial era, between 1492 and 1850, in the New World. The player embodies the leader of one of eight civilizations available in the game – the French, the Spanish, the Portuguese, the Dutch, the Germans, the Russians, the Ottomans and the British. The player must advance their civilization through five ages to unlock new technologies and units. The game takes the main gameplay elements of its predecessors, with three-dimensional enhanced graphics, despite the game being based on the engine of Age of Mythology. Age of Empires III is different to previous AoE games in that the player directs a colony (not a civilization). During the game, the player can call on his home city to help him; it can send food, troops, fortresses or other perks to the colony. In addition the player has at his disposal an Explorer, unique unit that is very useful because it does not die: it falls to the ground and can be revived by an allied unit. The Explorer is a great asset early in the game to discover the map. The Explorer follows the principal of starting with a scout in the Age of Empires 2 games, but is a more powerful unit from the very start. At the beginning of the game the colony is small (only a city center) and populated by some settlers. The goal of the game is to develop this colony to make it powerful, to dominate the New World. To do this, the player must build houses to house his troops; barracks to train infantry; artillery foundries to forge guns, stables to recruit riders and so on. Age of Empires III takes place during the colonial era from 1492 to 1850 in the New World. The campaign follows the story of the fictional Black family. These 3 acts are told by Amelia Black (Tasia Valenza). Act 1, Blood, narrates the adventure of Morgan Black, part of the Order of St. John of Jerusalem, in the Maltese lands (in the period of the Great Siege of Malta). Morgaan Black fights against the Ottomans (who are led by Sahin) and discovers that they are searching for the Lake of the Moon, where exists a certain Fountain of Youth. They also learn that a powerful organization, the Circle of Ossus, also seeks to take this fountain. His superior Alain Magnan sends him to search for it in the new world. Forced to stop in the Caribbean, he fights, then allies with the pirate Elisabeth Ramsey, known as Lizzie. Arrived at their destination, they capture Sahin, who tells them that Alain has preceded them, and that he is at the head of the the Circle of Ossus. The story ends with Morgan Black destroying the Fountain of Youth. Act 2, Ice, features John Black, Morgan’s grandson, and his friend Kanyenke. The story takes place in the second half of the eighteenth century, during the establishment of economic alliances between the German and French powers in the United States. The Cherokees led by Warwick attack the colony held by John’s uncle, Stuart Black. John and Kanyenke repel the Native Americans, but Stuart is captured, and forced to reveal the location of the Moon Lake. The Circle of Ossus seems to be back, and John and Kanyenke, worried, join the latter’s village in time to save his sister, Nonahkee, whom John is in love with. They continue the hunt for Warwick, assisted by the British who are also looking for Warwick. They destroy many facilities of the Circle of Ossus, and eventually discover the alliance of the latter with the Russians to gain control of the New World. With the help of miners, John manages to destroy the mighty Russian artillery in the mountains north of the continent. Act 3, Steel, begins in the United States of America in 1817, starring Amelia Black, owner of the Falcon Company, which was funded by John who became rich during the United States War of Independence. . After defeating a rival company, aided by Major Cooper, she met a French prospector: Pierre Beaumont. Pierre helps them to defeat the Mexican army. He later emerges as the new commander of the Ossus Circle, and is chased by Kanyenke to a cave where the map was hidden to go to Moon Lake. The lake is dry, and the circle is already recovering the treasures of the boats present in Act 1. Beaumont is defeated but manages to kill Cooper. Amelia learns that barrels of the water of youth have been transported to an Inca city in the Pacamayo Valley. She will immediately leave for South America, where she helps Simon Bolivar to defeat the Spaniards. Bolivar guides them through the Andes, and they manage to destroy the precious barrels, but Beaumont fled to the sanctuary of the Circle in Cuba. Beaumont is finally killed, and the place is completely destroyed, thanks to the help of the Spanish troops and the American fleet, marking the end of the Circle of Ossus. TL;DR Age of Empires III is a real-time strategy video game developed by Microsoft Corporation’s Ensemble Studios and published by Microsoft Game Studios.